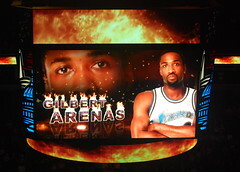 The word is out this evening, and it seems that Arenas’ season suspension will be his only punishment from the Wizards. Truth About It has the word from Wizards President Ernie Grunfeld: Arenas will remain a Wizard, and the team will not seek to terminate his contract. The Wizards have four years and about $80M left on Arenas’ contract.